The commission comprised delivery of design services for the remediation of a failing soil slope above the track north of Hastings, East Sussex. Movement was first recorded in 2014, at which time a temporary solution was implemented. The failure was investigated and found to extend 75m above track level to the premises of a small, local business at the crest. Throughout 2016, additional slope movement threatened the stability of crest structures and required the repositioning of the temporary support solution. The permanent works design comprises driven steel sheet piles with earthworks re-grading and associated drainage works. Fairhurst undertook the slope stability analysis and design of the permanent solution. This required several rounds of optioneering, in which numerous techniques were considered, including mass excavation and stone fill, soil mixing and use of electro-kinetic geosynthetics. The solution finally developed comprised three rows of driven steel piles to depths of up to 10m, with earthworks re-grading to stable angles and rear wall and down slope counterfort drainage. Throughout the development of the design process, Fairhurst worked collaboratively with all parties to meet a number of significant challenges, most notably access to the failing slope. The solution adopted allowed pile installation from cranes situated beyond the limits of the failing slope and allowed access to the local business premises to be maintained during the works. Due to the Fairhurst design team’s intimate knowledge of the site, Category III checking of the Temporary Works designs for the crane pads was carried out under a separate commission. As the project evolved, further challenges relating to the drainage situation came to light, requiring management of third party surface water and foul drainage. 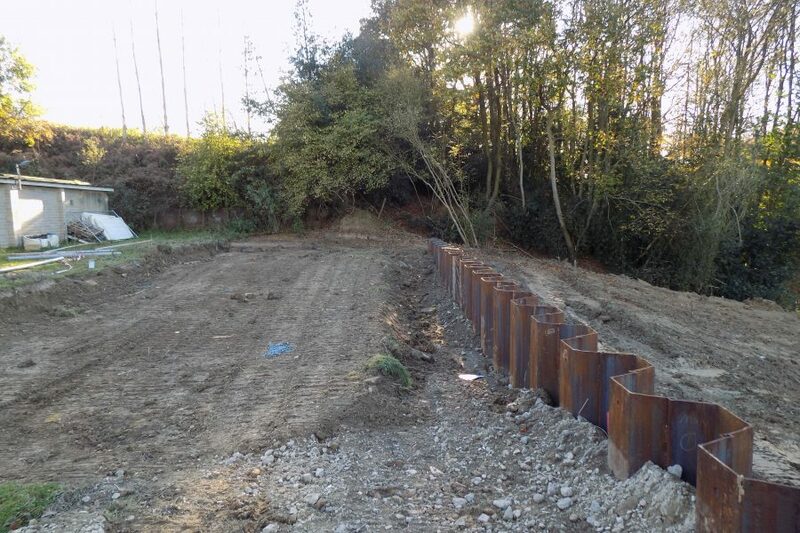 Fairhurst also provided input during the construction phase, including carrying out stability checks after one of the sheet pile walls encountered unforeseen ground conditions.